This is actually the second batch of polishes that the two ladies have sent me and I was floored by how smooth and buttery their formulas were - quality that I didn't expect to be there - at least, not in a brand new indie brand. I was pleasantly surprised to say the least and I've been hooked ever since! :) I loved that each polish had its own unique personality and was anything but dull. Whether it was linear holos, flakies, glitters, shimmers, or a mixture of these, the polishes were always stunning and such fun to wear! So blue! Too bad the violet shimmer was super hard to capture - you can see it gorgeously in real life though! The pink is so divine! This reminds me of new leaves in bloom - such a breath of fresh air! Loving this pale green - LOVE! It's the type of shade that anyone can wear - it's a staple for all collections - just beautiful! 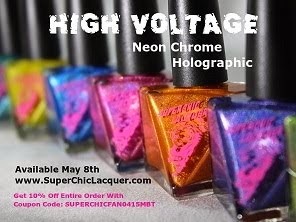 Another polish I absolutely adore - holo, soft, girly - j'adore! And last but not least is their limited edition Gilded Garden: described on their website as: "a strikingly vintage gold metallic polish with light blue shimmer undertones, rose gold sparkle flecks and a linear holo finish"
These are available for purchase through Fair Maiden Polish - you definitely don't want to miss this collection if you can help it!